It's a musical Iwata Asks with plenty of rhythm! 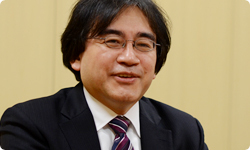 Mr Iwata sits down with developers from GAME FREAK inc. – best known for the Pokémon franchise – to discuss their latest game, which takes rhythm action to a whole new level of adventure! Pokémon-themed stages in the game, which is perhaps unsurprising as this is a GAME FREAK title. I’d imagine that there would have been some debate about whether or not to include songs from the Pokémon series in a game set in a fantasy world. Tell me how this decision came about. Well, as you say, we were extremely apprehensive about it. James and I discussed it a great deal. We thought that a lot of players would find it unnatural to suddenly hear Pokémon music in a game set in an unrelated fantasy world, especially when the main game has a plot. But as an experiment, we included one Pokémon song, and it actually turned out to be really fun. Yes, it really was. Then when we were considering how we might work these songs into the game, we turned to the stage selector which we had already come up with. We thought it would be a good idea to make the Pokémon levels selectable using that. So the idea was that these should be thought of as a kind of bonus tracks. Yes, that’s right. You could play through the story mode and then as an added bonus, you could access these other fun levels via the stage selector. There are going to be a lot of players who will really enjoy being able to play along with Pokémon songs. Those songs are really familiar, which adds a new element of fun to the mix. I think this is especially true when the music comes from a game, as it will have really got under people’s skins. That’s what I mean. You hear it again and again in a way that just doesn’t happen with hit songs, and it really gets under your skin! (laughs) I think it’s really interesting to do this with something like the Pokémon music, as you get to enjoy rhythms that are already incredibly familiar to you in a whole new way. It’s nice because you can place an enemy at the precise point where a particular section of the song kicks in. This means you’ll get the feeling that you’ve played the stage before, even if it’s your first time. There are also the cymbals and other percussion instruments which we spoke about earlier. You can add something new to the music, and enjoy a whole different take on it. It can really feel good to have all kinds of sounds and music going on as you’re playing. We’ve also subtly rearranged the songs to fit the action, so you can also enjoy listening to these new versions. Now, to conclude this discussion, I’d like to ask each of you to say a few words to the readers. Well, I’d recommend that everyone starts by playing the demo6! (laughs)6. 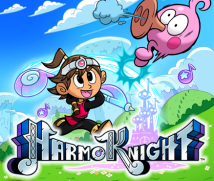 Playing the demo: The demo version of Harmoknight will be available to download for free from Nintendo eShop shortly before the game’s release. For more details on downloadable demos for Nintendo 3DS, please see this page of the Nintendo 3DS Games section. Please be aware that the demo version may be discontinued at any time without prior warning. I think that if you give the demo version a try, you’ll get a sense of the unique charm of this game. I think when you play the normal side-scrolling stages, it’s just really enjoyable to let yourself get carried away by the rhythm. Then you have the boss battles, which are incredibly exciting and will get your pulse racing. I really like action-packed video games, and I like to think that the boss battles are really enjoyable in this way. Then there’s the story, which is also really enjoyable. Right. It was a priority for us that this game should be simple and intuitive and in order to make its world of adventure accessible, we tried to communicate the story using images as much as possible. There are some really fun cut scenes in there. Tell me a little more about the story. ... Restore harmony to the world, right? That’s right. That’s basically the story. What aspects of the game do you recommend people check out, Ohmori-san? I think we have made a game that will be a lot of fun both for players who are confident in their abilities and players who aren’t so sure of their skills. It’s a game that anyone can play, but that doesn’t mean that it’s a game that’s not worth playing for more experienced gamers. Right. This is a little nerdy, but this game is in 60 frames per second; the rhythm action is honed to within one-sixtieth of a second and it has a Speed Mode, as well as secret stages. There are all sorts of things going on in this game. So if you set yourself the target of clearing all the stages in a really thorough way, you’ll have some really high hurdles to clear. That’s right. And you’ll also get ranked based on the score you have earned when you clear a stage. I really want experienced gamers to give it a go. Naturally, I’d particularly recommend Speed Mode for those players. 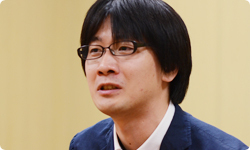 And how about you, Masuda-san? I really want to get across the degree to which it feels good to focus on pushing that button, and seeing how the images respond. Timing actions to within one-sixtieth of a second is a style of gameplay that’s only made possible by having physical buttons to press, isn’t it? Yes, that’s right. And I think we’ve come up with a game that lets you have experience a lot of really fun things. 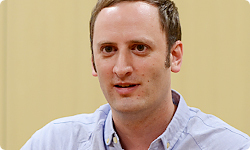 We are committed at GAME FREAK to making games that are easy for people to grasp. Pokémon is an example of this, as is this title which we want a lot of people to enjoy playing. 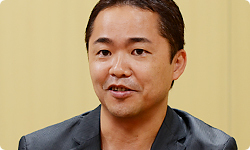 I wanted to ask you, Masuda-san, how it felt to be working on a new game like this under the new development system at the company? Well, there was a real satisfaction to working on it. I think when you actually come to work on a game, you get a renewed appreciation for how good the old development style was. Well, I suppose you could say that the original Pokémon was created in this way. Yes, that’s right. There were about nine of us who worked on it all the way to the end. With the Pokémon series, where there are a lot of fans waiting for each title, it is of course important to think about how to make the games interesting and fun. But at the same time, it is also important to come up with something completely new. But from the perspective of the player, when someone suddenly announces a new title, you have no idea what it is going to be like, so there may be a good deal of trepidation. With this title, we’ve pitched it as a midway point between download-only software and packaged retail titles, so it is a new direction you are forging. There’s a demo version you can try first and if you like it, you can purchase it and download it. I think this new type of structure makes it easier to try out new directions with video games. Yes, you’re right, and we are extremely keen to take on new challenges.